An architecturally designed cedar-clad house located on Point Veronica with stunning views of the greater Bay of Islands including Veronica channel to the outer islands through the bush-clad kiwi reserve area. Walk to town and beaches along the majestic coastal walkway (one of the areas must-do walks), or take a 4 minute car ride to central Paihia's cafes, restaurants and bars. Relax on one of the areas beaches or take a tour of the islands with one of the many tourist boats operating from central Paihia. This property is only minutes from it all! Our house is drug free and safe. It is drug tested after every tenancy and any offenders details will be passed on to the police for prosecution and any costs of repairs will be charged to the offending tenant. We are a kiwi family that love the outdoors, nature and time on the water. Our property is a reflection of this, and we love to see our guests enjoying the same. We purchased this property because of its unique geographic position, views and surrounding native forest reserve. It take advantage of the natural surroundings creating a private secluded feel and at the same time maximise our holiday accomodation experience. This is a very unique property it feels secluded, like you are living in a forest overlooking the sea. But you are geographically in the very hart of the Bay of islands and only minutes away from everything paihia, Opua and the bay has to offer. There is a view of the wider bay of islands and Victoria Channel. There is a view of the wider bay of islands, of paihia itself. watch the ferries, boats and yachts come and go as well as the many cruise ships that frequent paihia. There is no phone on site, but we have excellent cellphone reception. Air conditioning down stairs, and in the main master bedroom upstairs. Fans through out the house. Oil heater both upstairs and down stairs. All Bed Linen ,Bedding, Towels, Bathmats, Hand Towels, Face Cloths, Tea Towels, Dishcloths etc are provided. There are 2 full size washing machines and driers. Washing powder is also supplied. There are 2 full size clothes driers as well as a outdoor cloths line. Parking for a maximum of 5 vehicles. We have a good solid unlimited Broadband connection, at 20 ish mb per second, but does fluctuate slightly as it does anywhere in New Zealand. The Wifi login details are in our compendium. All Towels, Bathmats, Hand Towels, Face Cloths, Tea Towels, Dishcloths etc are provided. 3 x large refrigerators and freezers. Gas stove with electronic safety cut off. full size electric oven,. Oven must be cleaned after use. We supply Coffee, Tea, Sugar, Cooking Oil, Paper Towels, Salt and Pepper. Well Equipped. Please also let us Know if you find anything missing or have any god ideas of things that would be nice to have. The main table can seat 8 at a pinch and the breakfast bar will seat 2 there is also an outdoor dinning set on the upstairs deck. There are tv's both upstairs and in the flat down stairs. There is a native bush garden surrounding the property. We have 2 large decks with outdoor dinning, BBQ and loungers. All over looking the bay of islands through the native forest reserves. There is a spa pool for your enjoyment. Please use the shower before using the spa. Great place had a great time ,Nice chap. Very nice easy going guy to deal with and have stay. I would highly recommend as a guest and invite Gavin and crew to stay again any time. Perfect set up for multiple families. Very neat, clean and tidy. 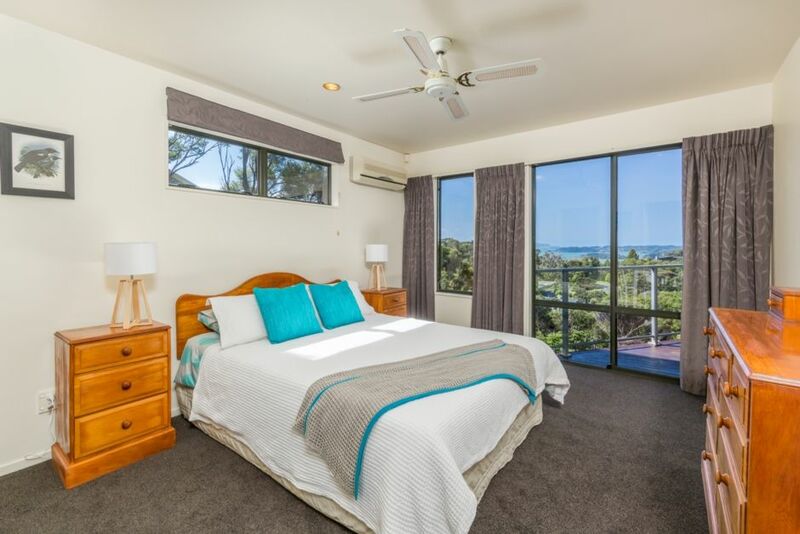 Wake up in the morning to beautiful views across the bay. Mike is fabulous to deal with and does everything to ensure your stay is nothing other than enjoyable. Highly recommend Broadview Retreat to anyone. Michael was wonderful, calling in advance to be sure he had the beds set up optimally for our group. Two stories, both with access to outside decks, beautiful view of lush trees and the water beyond. Immaculately clean, comfortable beds (always a plus!) and convenient kitchen. Can recommend this property; it is particularly nice for a larger group. We were three generations from two families and the setup worked well. Very happy with the house with lots of space for everyone. Beautifully renovated especially the carpet, bathrooms. Beautiful property, very tidy and relaxing. Beautiful property, very tidy and relaxing. Only a few mins drive to Paihia and views from property out to the water are amazing as well. Me and my family had a great time here. We will definitely be back! The property is spacious, well equipped and well serviced. The property is spacious, well equipped and well serviced. Broadview Retreat is a stunning property with equally stunning views. Paihia is the main hub and launching pad to The Bay of Islands a New Zealand enclave encompassing more than 140 subtropical islands next to the country's North Island. It’s known for its undeveloped beaches, big-game fishing and Maori cultural artefacts. It's also home to the 19th-century whaling port of Russell, whose waterfront promenade is lined with remnants from its days as the country’s first colonial capital. Walk through the historic Waitangi Treaty Grounds where you can be challenged by Maori warriors, admire the giant waka (Maori war canoe) and expansive views over the Pacific Ocean before enjoying a hearty meal cooked in a hangi (earth oven). Soak up the sun by peddle power as you explore old historic settlements, coastal views, lush forests and fascinating cultural sights on the Twin Coast Cycle Trail, stretching from the Bay of Islands' east coast to the Hokianga Harbour in the west. or just enjoy a day in the waitangi mountain bike park.